Cities are melting pots. I expect we understand this metaphor best as it relates to human beings. Cities around the world grow because people keep moving into them. People move from nearby rural areas, from other regions in the same country, or from around the world. When they arrive, they bring their skills, their beliefs, their music, their food, their culture…and we end up with the beautiful mosaic of urban life. The increased movement of people and goods around the world, especially with increasingly rapid modes of transportation, is the primary way that plants, animals, and microbes get around too – either as treasured reminders of home or as hitchhikers. So cities are melting pots of all kinds of life. Some of the new arrivals (the people and all the other organisms) are welcomed with open arms. But many are greeted warily or with open hostility. Family narratives and history books are full of stories about about the hard times that waves of human immigrants found in their new homes. Non-human immigrants – often referred to as exotic, introduced, or non-native species – have received a similarly cold welcome in most places. But the movement of plants and animals across the planet is both ancient and inevitable. It is also increasingly difficult to control. We face choices about which movements to resist and which to allow or perhaps even encourage. We also have the opportunity to plan as well as we can to get the most from our changing ecosystems. In the pre-human past, evidence of how organisms moved around the earth is inferred from information stored in fossils (and in genes, though I won’t get into that here). The big charismatic fossils – the dinosaur skeletons, preserved leaves – are well known, but the treasure trove of information about changing distributions comes from the microfossils. 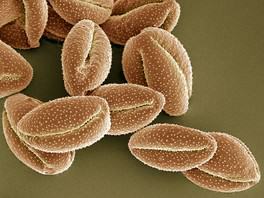 Microfossils include preserved pollen grains, bacteria, foraminifera, diatoms, and other small things. They tell us not only which organisms lived where in the distant past, but they are useful in reconstructions of ancient climate, dating geological events, and other kinds of historical inference. For example, microfossils preserved in wetland and lake sediments can tell us how terrestrial ecosystems shift as glaciers advance and retreat. For the movement of organisms throughout human pre-history we rely on the field of environmental archaeology. We can trace how crops followed people from their centers of origin around the world, we can trace which plant and animal species were important to which groups of people, and we can observe the origin of new kinds of life resulting from domestication – the hard work of generation upon generation of farmers. As we get into the historical era, and the origin of cities, we have written records of the migration of people and their associates around the world. For example, ancient Greek and Chinese texts discuss the relationships between people and both domestic and wild animals and their movements across the landscape. Another interesting source of historical information about the distributions of organisms are the biological collections in natural history museums and botanical gardens around the world. The oldest of these institutions have collections spanning several hundred years and – when studied collectively – give a remarkably vivid picture of our changing biological landscape. The reason I give this brief history lesson is to provide some context to what has happened since the middle of the last century. With urbanization well underway by the late nineteenth and early twentieth century and with long-distance transit links becoming more frequent and much faster, people and other organisms began to move like never before in the history of the planet. We know from all the sources of evidence that I just outlined that plants and animals have always been moving around – but fast ships, trains, and airplanes and booming international commerce represented a quantum leap in biological migration. Farmers noticed a greater frequency of new weeds and pathogens, foresters and other natural resource professionals noticed an accelerated spread of new plants and animals, and scientists and conservationists wondered what this meant for the organisms in the lands and waters receiving these newcomers. A watershed moment in the study of this movement was a book by the British ecologist Charles Elton, the Ecology of Invasions by Animals and Plants, published in 1958. Elton’s book not only started a new field of science called invasion ecology, it also shifted the language about this phenomenon in a militaristic direction. These new arrivals were “invaders” that would do harm to the receiving communities. The modern discourse in invasion biology frequently invokes military terminology: enemies battle each other, managers mount eradication efforts, ecosystems become overrun. This may motivate action against non-native species to potentially good effect such as recruiting volunteers to manage parkland, but it also runs the risk of alienating some portion of the public. Some will find the talk of war distasteful, but others may question why scientists and managers are using violent terminology (and actual violence) against wild animals and plants. For people who take a “live and let live” attitude towards wildlife, efforts against exotic species can be construed as xenophobic efforts against nature. Another serious issue with this language is that it suggests a war, but in many cases that war will not be won. Successful efforts to manage invasive species are almost always chronic rather than episodic. The best outcome for the manager is usually to keep the invader at bay; it is never really defeated. Cessation of the management effort will generally lead to reinvasion, unless all individuals of the invading species, including dormant propagules, are removed or there is a change in the environment that disfavors the invader. In cases where outright victory is unlikely (which is most of them), language about fighting to put things back the way they were is probably less useful than language about adapting to a changed environment. Another challenge with the militaristic language on invasions is that it has led to negative feelings about introduced species generally among much of the public. Even my environmentally-aware students and neighbors often seem disappointed when I tell them that the beautiful plant they were admiring is from some other part of the world. These negative feelings are often misplaced – the vast majority of new introductions don’t lead to any serious environmental damage. Scientists and practitioners know this and are focused on the exotics that cause the most damage – but a less well-informed public concerned about nature my tend to associate all exotics with damage. Many of these introduced species thrive in habitats with frequent human disturbance – like so many areas in cities. They may live side-by-side with indigenous species that also tolerate the disturbance, but their presence isn’t meaningfully detracting from their neighbors. And these new arrivals may be adding something – a bit of shade, an extra splash of green or color in a concrete landscape, a morsel for the next link in the food chain. To anthropomorphize a bit, they are newcomers that are willing to settle down in rough neighborhood and do their part to improve the community. 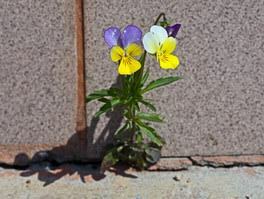 There’s something beautiful about life grabbing hold and bearing fruit in the crack of a sidewalk. A zebra mussel-encrusted current meter near Michigan City, IN. Lake Michigan, June 1999. The motivation behind both the military language and the negative public perceptions comes from examples of some truly damaging invasions. Zebra mussels in North American lakes have added hundreds of millions of dollars to the cost of managing freshwater infrastructure, introduced rats on islands have driven many kinds of birds extinct, introduced woody plants like Myrica in Hawaii and pines in the South African fynbos have fundamentally changed those ecosystems, and introduced pathogens have devastated populations of plants, wildlife, and people throughout history. These invaders have compromised critical functions of the invaded ecosystems, eliminated other species, and borne tremendous costs to human communities. I don’t think anyone can win an argument that says all exotic species are ok. However, the relatively small number of clearly damaging examples has led to a bias against non-native species generally and to some misguided efforts at controlling dubiously harmful species. A group of scientists, many of whom had studied invasive species for much of their careers, published a short paper in Nature in 2011 urging conservationists to shift their emphasis from where a species originated (native vs. exotic) to the specific functions of those species in their new habitats. The authors make the point that the world’s ecosystems are changing rapidly in response to climate change, altered nutrient inputs, and urbanization, so the idea that non-native species should be managed to protect status quo communities of native species is increasingly obsolete. Many invasive species management programs are very expensive and – in the long run – unlikely to succeed. Not only is it nearly impossible to “put the genie back in the bottle”, but species composition will shift with environmental changes, just as it always has. This paper generated significant opposition from the conservation community and from natural resource professionals who had personal experience managing damaging invasions. Many of the counter-points from this community are also quite valid – these professionals do focus on the damaging species rather than lumping all non-natives together, we have an obligation to attempt to stop extinction from damages wrought by humans, and many invasive-species management projects have been successful, at least at local scales and over short time periods. The broader point I take from this debate for cities is that we should engage in a critical discussion about our goals in managing urban vegetation and wildlife. Cities already represent a significant change from the indigenous landscape – altered land cover, climate, hydrology, chemistry, soils, disturbance regimes, and a suite of other factors. And as much as the physical environment of cities has already changed, in most parts of the world it will change even more – and possibly more rapidly – as climate change affects the timing and intensity of storms, sea levels rise, and growing urban populations increase demands for food, water, and energy. Add to all this physical change the immigration of new plants and animals connected by global trade and human migration and you realize we are facing a future where it would be foolish to believe that our urban environments should look or function exactly like they have in the past. This is not to say that I think we should give up on preserving native species or managing for native-dominated systems in urban landscapes. There are many good reasons to favor natives where feasible: native species may provide goods or services that we value more than exotics, species that have coexisted for long periods form complex networks that be more stable or higher functioning, we have an ethical responsibility to care for the land and its inhabitants, and there is real value the connection between people and familiar environments. Even in cases where it is hard work to protect native species, the benefits may outweigh the costs. However, this calculus isn’t always easy. In New York City, one of the major invasive control programs involves removing exotic vines, largely porcelain berry (Ampelopsis brevipedunculata) and Oriental bittersweet (Celastrus orbiculatus), from forested parkland. These vines, both from temperate Asia, grow vigorously in canopy gaps and prevent the recruitment and growth of trees that would, in the absence of the vines, grow up and close the gap. Forest ecologists from the NYC Department of Parks and Recreation Natural Resources Group have mapped vine-dominated canopy gaps through time and found that forest succession is arrested by the presence of abundant exotic vines: vine-dominated patches tends to stay vine-dominated patches. As part of a citywide effort to add forest canopy, Parks has invested significant time and money to remove these vines and plant young trees. They manage these reforestation sites for years after the tree planting, primarily by removing vines that have regrown. Their expectation (and hope) is that some of the young trees will grow and close the canopy gap, reduce light to the understory, and inhibit the regrowth of the vines. Over time, urban forest canopy will increase, light and soil resources will be captured by trees and thus be unavailable to the vines, and Parks can scale back their maintenance. 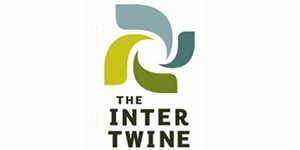 This intervention could shift the system from vine-dominated patches to tree-dominated patches and improve some services: more carbon storage, better stormwater management, and improved visitor access in the closed-canopy forest, but with some loss of the fruit resource the vines provided to wildlife. On the whole, this would improve the parks and could be a case of effective long-term management of exotic species. As a second example, Japanese knotweed (Fallopia japonica, synonyms Reynoutria japonica and Polygonum cuspidatum) is an herbaceous perennial originally from Asia and now common to riparian wetlands, roadsides, and waste places throughout New York City. Knotweed can grow in very dense stands that displace other kinds of vegetation – a stand of knotweed is often just knotweed. The banks of the Bronx River support very large populations of knotweed and other exotic species which the NYC Parks department is beginning to manage. The primary goal of this management is to improve conditions for native plants and wildlife in and along the river. They accomplish this through the physical removal of knotweed (excavating rhizomes from soil – backbreaking work) or by spraying with herbicide. Removal is followed by replanting native shrubs and herbaceous plants. The expected return for this effort is the recovery of high diversity native vegetation, which will support both terrestrial and aquatic wildlife. 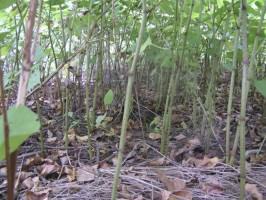 Underneath a stand of Japanese knotweed – more knotweed and knotweed litter. Photo: Jacoba Charles. Managing the knotweed long term will be challenging. 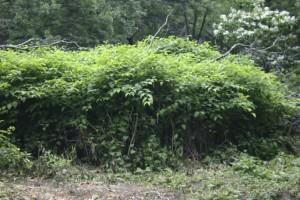 It spreads quickly by rhizomes and fragments and – unlike the vine example above – it is not clear that the establishment of native vegetation will prevent the reinvasion of knotweed. To maintain diverse native communities in this park may require a long-term commitment to removing knotweed. The protection of native plants and wildlife in high-value sites like Bronx River may be worth the effort, but I have lately begun to wonder about the broader set of functions that knotweed may provide. It can grow rapidly in a range of habitats and thrives in poor soils. Stands of knotweed are productive and the roots and rhizomes secure soil on slopes, likely preventing erosion and perhaps trapping sediment from floodwaters. Honeybees collect pollen from its abundant flowers and the young shoots are edible. Research on the ecosystem effects of knotweed invasion in Europe is mixed, showing some positive, some neutral, and some negative changes relative to non-invaded stands. When knotweed is displacing high-value riparian vegetation, perhaps we should manage it intensively to protect native biodiversity. But when it is growing on marginal lands and the costs of invasion are lower, perhaps these benefits outweigh the costs. There is so much knotweed in New York City there’s no way we could effectively manage it all, but perhaps we should look at though a utilitarian lens rather than focusing on it’s geographic origin. The realization that cities are experiencing rapid environmental and biotic change should be forefront in our minds as we choose targets for the living infrastructure of our cities. Which biological invasions should we manage and which should we just allow to proceed? For those invasions that we choose to manage, how will know we have succeeded? Or when will we decide to stop trying? When planning a greening program, what is our target in terms of ecosystem structure and function? What suite of species, both native and non-native, will get us to that goal? When choosing species for green infrastructure, are we choosing species that will do well in the in city in 2030? What about the city in 2100? At some level, I am disappointed by the realization of all this change. I like the indigenous biological communities of the region where I live. But I also realize that the ecosystems that will replace the preceding system will have their own appeal – both aesthetically and functionally. I take some hope in the imagery from a post by Stephanie Pincetl last summer about the riot of trees from around the world growing in Los Angeles, which sounds pretty great. The recent post by Eric Sanderson about learning from (native) species about resilience to storms reminds me that the new systems will still be based on the same template as the historic system. Exotic species only rarely result in massive changes; the more common result is an iterative revision to a functioning system – forests still grow and rivers still run. And perhaps the next version of the system will even benefit from the new arrival in the melting pot. Thank you, Ryan, for your comment and your professional perspective. It sounds like we are largely in agreement here – the invaders that cause extensive damage should be managed and the new arrivals with limited negative (or potentially positive) impact should be tolerated or encouraged. My main point is that we will be better off shifting the discussion to the real impacts on ecosystems and away from the geographic origin of the species. I suspect that the public would be more likely to support management when the case is framed in terms of functions rather than a case based on origins. I also think that an explicit focus on functions will aid management agencies in prioritizing their work and explaining it to the public. Your point about early detection and response is important, and it presents a bit of a conundrum to the focus on impacts. If we wait to see if the impacts from a new arrival are really negative, then we’ve lost the chance to nip the invasion in the bud, so to speak. Perhaps the way forward here is to make our best professional estimate about which new arrivals are likely to cause damage (based on the traits of the species or the vulnerability of the system) and take preventive steps in the highest-priority cases. Fortunately, there is a significant body of research on predicting “invasiveness”. It’s tempting to err on the side of caution, but I think we all need to be mindful of allocating scarce management resources wisely. 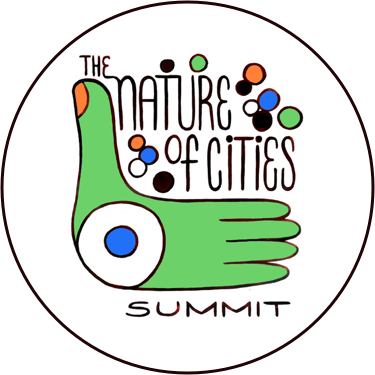 In a highly-modified urban environment, our goal should be managing for functions: climate, water, and air services, productivity and stability, provisioning for recreation, aesthetics, and biodiversity, etc. I think this will involve carefully considering which mix of species will best provide those functions – and that mix may include exotics. I definitely agree that many or most exotics are relatively benign. But some are truly damaging and wreak havoc on native ecosystems, excluding native regeneration and resulting in systems that less diverse, complex, and resilient. As a practictioner, I focus my control efforts on the worst invaders, oftern turning a blind eye to ubiquitous exotics are considered benign. Unforunately, this nuance (some are ok, but some are bad) is very hard to convey to the general public. My fear is that if ecologists start promulgating a generalized tolerance of exotics, we will lose the political and cultural support (and funding) for important and necessary invasive species control. Another problem is that is difficult/impossible to predict which new exotics will become truly damaging/problematic. As those of us working to control invasive plants and restore native plants know all too well, the cost of control is significantly lower and likelihood of success is significantly higher when we intervene early in the invasion process (i.e., Early Detection Rapid Response). 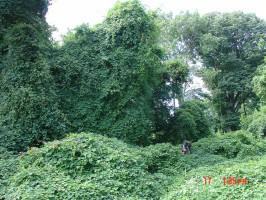 Once a damaging species is well established, like English ivy in the Pacific Northwest and Japanese knotweed throughout North America and Europe, control efforts are expensive and sometimes futile. 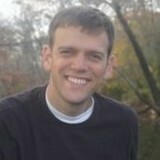 Matt’s provocative posting on exotic/invasive species (as well as the “Nature” article he references) remind me of the problems inherent in simplistic, black-and-white thinking (in this instance, the notion that all exotic or introduced species are “bad” and must be eradicated or at least battled). So often in life, things aren’t so much black and white as many shades of gray. I’ll have some additional thoughts on introduced species in a future posting of my own, but wish to thank Matt for the “food for thought” he offers here. Thank you for this post. I’ve just been reading “Rambunctious Garden” and it’s good to see more writing on this topic. I think it’ll take a while before the urge to remove all exotics in every instance lessens, but it’s good to be thinking of these possibilities. In Seattle the problem is English Ivy taking over the forest floor and preventing regeneration. But there are plenty of things that don’t establish monocultures that could be left in the forest.